Every year for my daughter’s birthday she requests that I take cupcakes in to her class. For the past two years she has asked for this swirled cupcake frosting. Last year she wanted pastel colors for her cupcakes which fit her personality well. Calm, soft-spoken, but still beautiful. This year she wanted bright, colorful, and outspoken colors which was fitting since she has become quite the social butterfly. 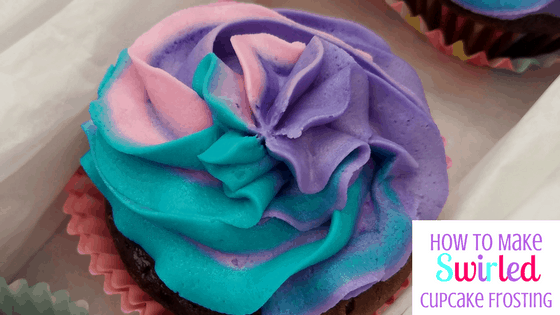 Learning how to make swirl frosting for your cupcakes and actually really easy and doesn’t have to be messy! Trust me…. I’ve done it the hard way and I figured out how to do it the EASY way! Lay a price of saran wrap on your counter, sticky side down. Spread out equal amounts in the pattern you would like to use on the saran wrap. Roll the saran up so that the colors on each end meet up and gently roll tight. Make sure not to blend the colors into each other. Press the saran wrap together at the end. Using scissors cut the excess saran wrap off. It should look like this when you are ready to put it in your piping bag. I used the Wilton’s large open star tip for these cupcakes. Insert the tip into bag followed by the frosting, cut side down. Gently work frosting down into tip making sure to work all of the colors down the tube together. That’s it. You’re done! See how super easy and mess free that was?! Awesome! I love the colors. They would look amazing on a little girl’s birthday party! My daughter’s birthday is coming soon in a couple of week and I’ll definitely consider this! You made this sound so easy lol. I’ve attempted this once, but it didn’t turn out as neat as i wanted it. I think I’ll start practicing again with birthdays coming up. Wow that looks incredible! I always wanted to know how to do that. Thanks for the post! Wow this looks so much easier than the other ways I have tried. Im so looking forward to trying this out! This is super cool! I don’t bake but I love how pretty they are! I hope I get to have those neat hands like yours. I was only trying one-colored frosting and it’s already so messy! My husband just ends up spreading the frosting onto the cupcake like jam. Haha! This looks so good and you make it look easy!